Macaroni and cheese - or macaroni cheese, as it's called in England - may not be gourmet fare, but it is one of the most popular comfort foods ever. The dish has been on American menus since the early 1800's, and the packaged version was introduced in 1937. Homemade is no more bother than packaged if you do what I do--divide the recipe between two smaller baking dishes and freeze one for another day. You can put some breadcrumbs on top before baking, but I don't bother because I'll be getting enough bread in the bread I'll be eating with it. I've always enjoyed macaroni and cheese as a main dish, but in my travels in the South I noticed it was never missing from a long list of "sides." Trouble is, when macaroni and cheese is on the menu, that's all I want. Well, that and a biscuit! Maybe a glass of iced tea, but not "sweet tea." Tell me how you feel about macaroni and cheese and, if you're from the South, whether you're a fan of sweet tea. And tell me if you have experienced graininess* in your macaroni and cheese and what you did about it. 1 In 5 1/2-quart Dutch oven (I use Le Creuset Round French Oven), bring 4 quarts of water to a boil. Add macaroni and salt; cook for the time specified on the package, or until tender. In heavy-bottomed 2-quart saucepan, heat milk to a simmer; do not boil. Drain pasta in colander and set aside. (It will clump together as it cools, but not to worry, the clumps will separate when you stir the pasta into the sauce. 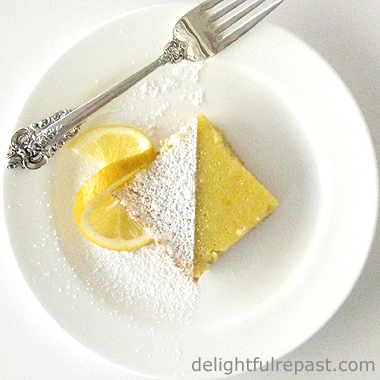 Or you can drizzle on a couple teaspoons of olive oil or melted butter and give it a toss right in the colander.) Preheat oven to 375 degrees. Lightly butter 13x9x2-inch baking dish (or two smaller, shallow baking dishes). 2 In same Dutch oven, heat butter until foaming but not browning. Add flour, salt, dry mustard, pepper and cayenne; whisk for about a minute. Gradually whisk in hot milk, whisking constantly until mixture slowly comes to a full boil. Reduce heat and simmer, whisking occasionally, for about 7 minutes. Remove from heat and let cool slightly for 2 minutes. Gradually whisk in cheese. When cheese is fully melted, stir in the cooked macaroni. 3 Pour into prepared baking dish. Bake at 375 degrees for 30 minutes, or until bubbly. Let stand 5 minutes before serving. * I must admit this batch of macaroni and cheese was not perfect. It was just a little bit grainy, a common problem with macaroni and real cheese. I'm told using whole milk (I only had 2%) will help prevent graininess. Maybe adding about a half a cup of heavy cream would help. Also, replacing 1/4 of the cheddar with processed cheese is recommended for that reason. I'm sorry, but I can't bring myself to eat processed "cheese;" would rather have a little graininess! But next time I'll try using 1/4 Monterey Jack cheese. Since it is a very smooth, melty cheese, maybe it will have the same smoothing effect as the processed cheese without the ick factor! Ah childhood memories, definately a midweek dish or better still for a meat free Monday ! Thanks, Marc. I had forgotten the meat free angle! I'll be making it again on Monday. Childhood memory, indeed. Haven't had macaroni and cheese since church camp for preteens. I don't want to mix theology and starch, but I think I wandered off the reservation for both. On the other hand, you make M&C sound so savory that I have no reservations on trying it again. I think I must have converted to tomato cheese on toast, which is as close as I come to carbo-loading on anything that doesn't come from the planet of sugar and grease these days. Thanks for reminding me that Mac and cheese isn’t something from McDonald’s. Sully, macaroni and cheese is only as good as the cheese. I'm sure what you had at camp was NOT proper cheese, but rather one of the ever popular "cheese foods" out there. I love macaroni and cheese. It's so comforting. Like you, I also prefer the baked version and more sprinkling of cheese on the top is a must for me. Yum. Thanks, Michael! Yeah, you can't have too much cheese, might as well throw a little more on top, I always say! Thanks! Glad you like it. Unbaked is good, but baked has little crunchy bits on top. Someone at Tillamook Cheese just told me that potato starch is put on pre-shredded cheese to keep it from clumping together. That doesn't sound too sinister! Ah Jean, I can cook macaroni cheese. I call it pasta bake. I don't put paprika in but sometimes herbs definitely black pepper and pieces of ham and small pieces of broccoli too. Pineapple!!! I go for variations in colour, whatever comes to hand really. Served with a side salad, olive oil, more ground black pepper and a little sea salt,(love the stuff). But that's just my taste. When I get in from work, if I'm home first, it's something I can make easily. (I do have a few other things I can do as well by the way). As for quantities, I just throw it all together and go by experience. Thank you, Tony! I love putting a bit of ham or broccoli in my macaroni cheese from time to time. There are all sorts of mix-ins that work, but I'm afraid for me pineapple is not one of them! You're too adventurous for me, Tony! I don't like pineapple on my pizza either. A lot of people sprinkle paprika on their macaroni for looks. I'm usually in too much of a hurry to get it into the oven. But I stir that bit of cayenne into the sauce to give it just a bit of heat. I'm a huge fan of macaroni and cheese. And I cannot stand the stuff you buy in the box; it is disgusting. 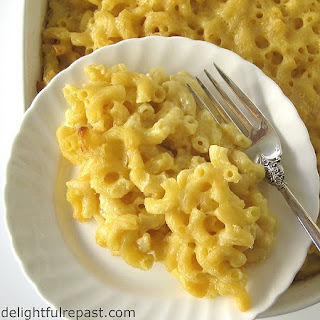 Real mac and cheese (homemade with the best cheese) is amazing and oh so comforting. Gosh ... I'm getting hungry just thinking about it. Jenners, thank you. I'm always glad to find another hater of the boxed stuff! Thanks for posting it, I've been craving baked macaroni and cheese for a few days! And I too, do not like sweet tea like most of my loyally heavy on the sugar southern food eating friends. Thanks! Too much sugar in anything just ruins it for me. I like to taste something besides sugar. Thanks, Jenn! I wish I DID have some leftovers! I crave this stuff! It's amazing how a few simple ingredients can come together into something so tasty and satisfying. Well, give your husband a good six months longer, then give it a try! I know how it feels to be burned out on something. Try adding a dusting of cornstarch to the shredded cheese and use half condensed milk, might reduce the graininess. Thank you. I know you meant to say "evaporated milk" (condensed milk has sugar in it). Would it change the flavor? Probably wouldn't be noticeable with all that cheese, would it? Dusting of cornstarch? Sounds like something to try! Thanks! I love mac and cheese when it is made from scratch, but I so rarely make this casserole, unless family is visiting. I love a crispy cheesy topping. Thanks, Vic! I love to make it even for just myself because it reheats so well. Or you can put it in little individual casseroles, freeze them, then pull them out one at a time to bake in the toaster oven. Thanks, Carole. Now I'm in the mood for it, think I'll change tomorrow's menu plans!